Who is this guy, Bill Lovelace? It's a great story of a local boy who lived his dream. Click on picture to find out. (August 23, 2002) -- A Costa Mesa resident's non-agendized complaint to the Costa Mesa City Council concerning increased overflights sparked a brief but potentially significant colloquy concerning LB Airport. At August 19 Costa Mesa City Council meeting, Costa Mesa resident Don Elmore spoke during the period for non-agendized items and indicated he'd noticed increased flights coming over Victoria St. and going west over Wilson St. This drew a response from Costa Mesa Councilwoman Libby Cowan who said, "I've had [Costa Mesa City Manager Allan Roeder] look into this, because we've heard of this up and down Costa Mesa, and I believe those are actually flying into Long Beach, not out of John Wayne." Costa Mesa City Manager Allan Roeder acknowledged, "...[C]hanges in air space, and they [the FAA are] are still continuing to make those changes, we are getting more aircraft on the arrival pattern to Long Beach airport over parts of the west side of Costa Mesa, including parts of Mesa Verde. And we have been in touch with the FAA, they are still making those changes...You are seeing more commercial traffic on areas in the west side than what we have seen previously." Costa Mesa Councilman Chris Steel added, "I agree and can verify what Mr. Elmore said because last week I was up on Canary [Dr.], which is up on Mesa Verde and I was talking to a resident on the street there and we saw planes going up over Adams [Ave.], north of Adams and they were coming from, I said is this coming from John Wayne? I couldn't believe that..."
The exchange raises the prospect that coastal and north Orange County residents, including areas in Costa Mesa and Huntington Beach, could become part of a regional effort to oppose increased flights at LB Airport. 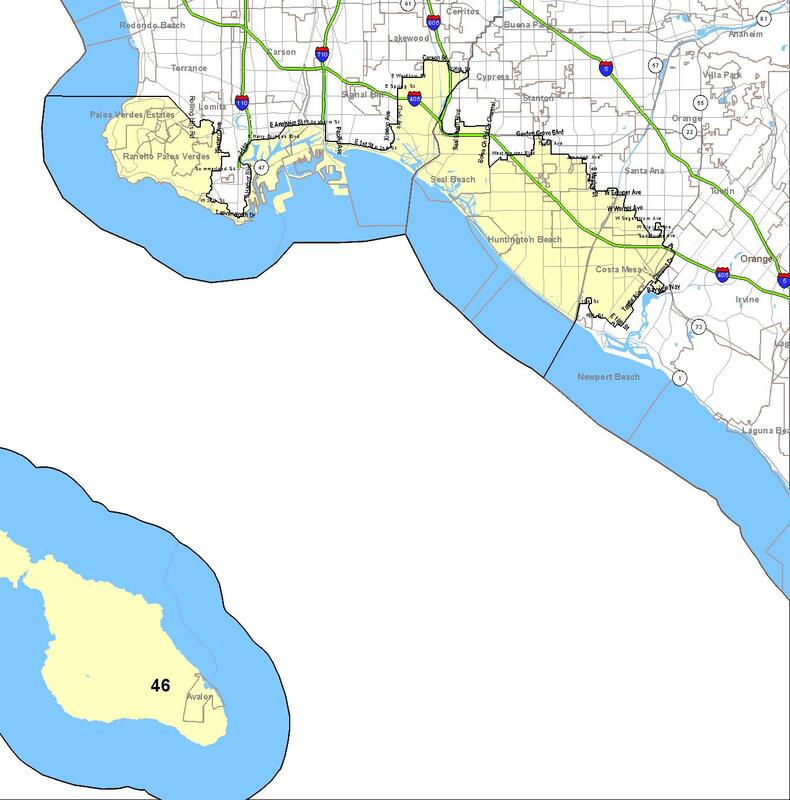 The area dovetails with parts of the newly formed 46th Congressional district (in yellow on map below) to which incumbent HB-based Congressman Dana Rohrabacher is seeking election. To enlarge map, click on it. In an related event, on August 13 two Orange County residents attended LB's City Council meeting and urged LB to form alliances with nearby Orange County areas to oppose more LB Airport flights and support revised plans for the voter-stopped El Toro Airport. Neither OC speaker drew any visible LB Council reaction. "We look forward to developing relationships with our neighboring area cities and their residents." At the LB City Council's August 27 meeting, LB Councilmembers will consider the text of a resolution urging regional efforts to send flights inland to Palmdale and Ontario.